The original game ran on Windows 95, and it was possible to coax it into running on Windows 98, and Windows ME if you were lucky (though you’d have to have been pretty unlucky to get stuck with the ill-fated Windows ME). Gameplay ran over 120 years (playable in about 40 hours or so) from the age of steam to monorails, and featured aging of vehicles, new technologies, and growing towns and communities. All in all, it was very well received, sold quite well for about a decade (including budget labels) and remains one of the milestones in creative simulation gaming. The same game engine was used in Roller Coaster Tycoon 1, and Roller Coaster Tycoon 2. Transport Tycoon and Roller Coaster Tycoon 2 are among Sawyer’s most celebrated work in the genre. 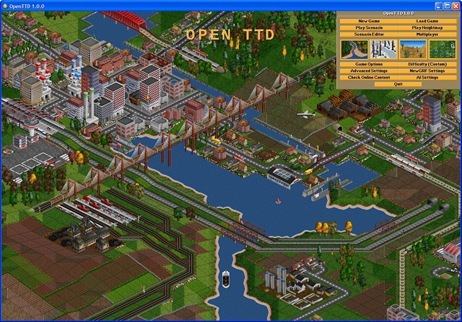 In 2002, Swedish programmer Ludvig Strigeus began reverse engineering Transport Tycoon, and the first public release of that effort became available in 2004. This week, six years after that release, OpenTTD finally reached version 1.0.0, now fully complete and fully playable; slick, polished, fast and cross-platform. If you’ve got the old Transport Tycoon Deluxe CD, OpenTTD is quite capable of using the graphics, sound and music right from that. If not, there are free versions of all three data-sets available for use. If you use the Windows installer (a mere 3.5MB) will download and install those packs for you at your option, adding a mere 15-20MB of download to the process. Binary downloads are also available for Debian Linux (Lenny and Squeeze), Ubuntu Linux (Karmic and Lucid), and generic Linux. All are available in 32 and 64 bit varieties. 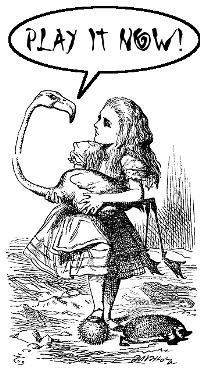 If that doesn’t tickle your fancy, there’s source-code. All of the technology that OpenTTD uses is widely supported, and should also work just fine on *BSD and Solaris. The game itself runs smoothly in any resolution from 640×480 upwards, either windowed or full-screen. OpenTTD will present information in roughly 30 different currencies (or you can add/create your own), supports 50 different languages (though translations are still needed to complete Ido, Urdu, Macedonian, Basque and Thai), handles vehicles driving on the left or the right, and measurements in Metric, British Imperial (as used in the USA) or SI. OpenTTD sports as much information as you might want on vehicles, stops, stations, depots, industrial facilities and more. There’s even a (free!) downloadable content system for downloading new AI modules, maps, scenarios graphics packs, and modifications. There’s a manual online for those of you who want something to refer to, and right-clicking on pretty much any control pops up some explanatory information. Don’t just take my word for it. Open up the manual, grab a binary, install it and play it now! And consider a donation if you feel it is awesome. What an interesting coincidence. Only th eother day I unearthed the CD of “Ceasar III” (1998) and quite enjoyed playing it again – and my kids love it too. OpenTTD is a great game and fiendishly addictive for me. I forgot about this for a couple of years and was happy to find it still going, and infact quite so far advanced since I’ve last played. Glad it no longer requires the original Transport Tycoon files too. Funny to think Chris Sawyer wrote the original Transport Tycoon (and Rollercoaster Tycoons 1 & 2) in assembly. Wonder what he’s up to now.